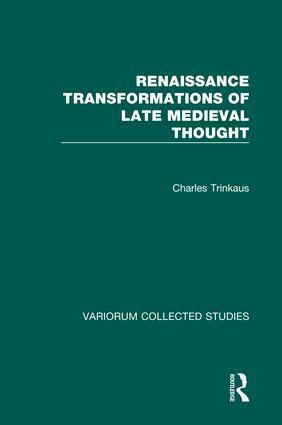 Charles Trinkaus can be counted among the eminent intellectual and cultural historians of the Renaissance. This new collection of his articles brings together pieces published since 1982. The studies are concerned with Italian Renaissance humanists and philosophers who tended to affirm human capacities to shape earthly existence, despite the traditional limitations proposed by some scholastics and astrologers. Professor Trinkaus holds that, without abandoning their Christian faith, or their acceptance of physical influences from the cosmos, these writers, in their stress on human capacities, were responding to the vigorous activism of their contemporaries in all aspects of their existence. The final four papers also provide a series of reflections on the modern historiography of the Renaissance. Contents: Studies: Italian humanism and scholastic theology; Antiquitas versus Modernitas: an Italian humanist polemic and its resonance; Humanistic dissidence: Florence versus Milan or Poggio versus Valla? ; From the twelfth-century Renaissance to the Italian: three versions of ’the dignity of man’; Lorenzo Valla on the problem of speaking about the Trinity; Lorenzo Valla as instaurator of the theory of humanism; Coluccio Salutati’s critique of astrology in the context of his natural philosophy; Lorenzo Valla’s anti-Aristotelian natural philosophy; The astrological cosmos and rhetorical culture of Giovanni Gioviano Pontano; Cosmos and man: Marsilio Ficino and Giovanni Pico on the structure of the universe and the freedom of man; Marsilio Ficino and the ideal of human autonomy; L’Heptaplus di Pico della Mirandola: compendio tematico e concordanza del suo pensiero; Commentary: Humanism, religion, society: concepts and motivations of some recent studies; Renaissance reasoning; Renaissance semantics and metamorphoses; Renaissance ideas and the idea of the Renaissance; Index.